I saw an article by Joseph Weber for The Washington Times that I want to share because I read something interesting in that article. Republican strategist Karl Rove on Sunday chastised President Obama for accusing the U.S. Chamber of Commerce of soliciting foreign money to influence midterm races. "They have not a shred of credible evidence to back up those baseless lies," Mr. Rove, deputy chief of staff for President George W. Bush, said on "Fox News Sunday." "How dare the president do this." Mr. Obama accused the chamber twice last week — on trips Thursday for Democratic candidates in Maryland and Illinois. It is funny that Rove would make such statements when he is guilty for spreading baseless lies with no shred of credible evidence to back them up - consistently. Obama wasn't the only person to criticize the Chamber of Commerce - White House senior advisor David Axelrod also spoke out about the group's funding. White House senior adviser David Axelrod said secret donations to outside political groups are “a threat to our democracy,” singling out the U.S. Chamber of Commerce for criticism less than a month before elections that will determine control of Congress. “If the Chamber opens up its books,” Axelrod said on CBS’s “Face the Nation” program, “then we’ll know. All we have now is their assertion” that foreign money isn’t used for advertising in U.S. elections. Axelrod made a very interesting statement - it mirrors the comments made by conservatives against Fox News and conservative pundits in regards to things like the construction of the "Ground Zero Mosque" or unions. Of course the right pushed back to Axelrod's and Obama's statements - they are a bunch of hypocrites. Obama criticized Republican-leaning groups at a campaign rally for Maryland Governor Martin O’Malley in Bowie, Maryland, on Oct. 7, saying their advertising is funded by contributors whose identity isn’t known. Thomas J. Collamore, a chamber vice president, claimed that the accusations are "unfounded and unproven" and that "complies with all applicable laws, and no foreign money is used to finance our political activities, which are only a fraction of the work we do to promote free enterprise in America." All I have to say to Collamore is put your money where your mouth is - disclose the source of the money they receive. Update - It has been brought to my attention that a similar article regarding the Chamber was posted on Big Government by their editorial panel (see comments below). There was a comment left by HuskersLoveBo that pointed out the hypocrisy, such as the constant posting by the Big types attacking the Park51 community center, and as can be expected, HuskersLoveBo was targeted by the fans of Big Government. 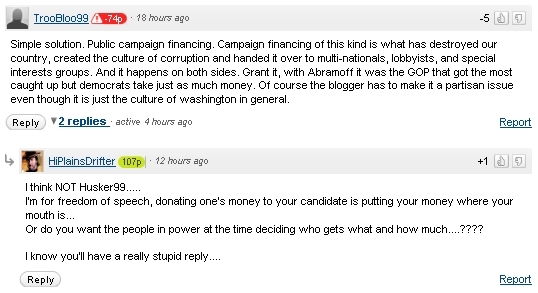 Some of the posters commented on Obama's campaign finance history, but even then they ignored their hypocrisy. I found many interesting articles online from conservative sources that attacked the Obama administration for accepting foreign cash - some on Big Government point to a couple American Thinker articles that discusses the purchase of t-shirts by some people in Gaza but those articles fail as well. One of the articles does mention that the Obama campaign returned the cash, but then they state that they found no evidence of a refund - a "fact" they do not source and quickly move on from. 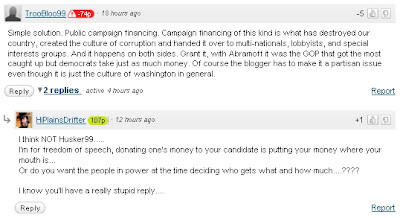 I found another article I thought was interesting which was from Newmax circa 2008 that discussed the potential for foreign donations to the Obama campaign - their thesis is that the number of donations that are not even numbers mean they are contributions from foreigners, but again, their arguments operate solely off of assumptions. Update - I checked back on the Big Government site to follow up on the comment moderation and to my surprise, the comments have been taken down. The comments by CerealHead, no_more_deceit, and wildbil were removed by an administrator, while the comment by copperpeony just happened to dissappear altogether which leads me to believe that they may be a staffer of Big Government. It appears copperpeony believes all black people don't care about he goverment - according to copperpeony, all involvement of blacks in the government was to ensure the election of Barack Obama. In addition, I just wanted to point this one last comment out. While TrooBloo99 makes a very good comment, and is rather party-neutral, I couldn't help but notice what the Big fanatic called TrooBloo99 - "Husker99." It seems that HuskersLoveBo really does get under their skin! We must think alike. I posted a very similar comment on Biggovernment. Go read some of the responses. I just love to get under their skin. Nine times out of ten, they have to resort to name calling because they can not face the hypocrisy of their own posts. It should not come as a surprise though. Their heroes are Rusty the Chickenhawk and Breitbart. Thanks Kevin. I updated the post again! I noticed after a comment of yours another person with a negative score left a comment, which led to the Big Government drone to make fun of his name referencing you in the process! Looks like you are well known over there!